Motorola DROID MAXX Makes First Appearance in Press Render? That folks, is the new Motorola DROID MAXX, coming soon to Verizon. At least according to @evleaks, who posted the press render this morning with only the words “Motorola DROID MAXX, for Verizon, 2013.” So we have no specs or even a release date, but we can grab some other information courtesy of the render. 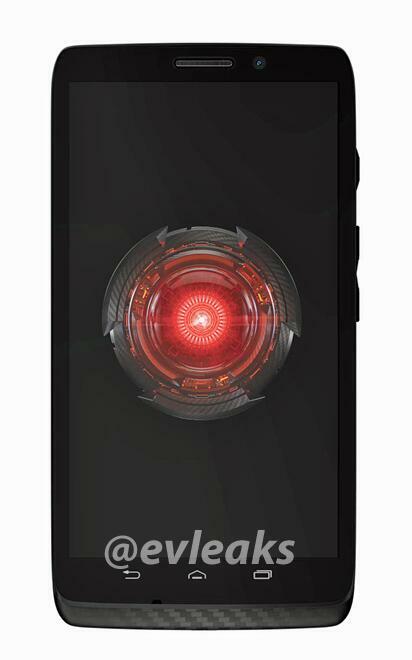 First, we’ve got the classic red DROID eye, confirming that this phone is indeed a part of the DROID brand. Next, we’ve got kevlar wrapping from the back to the front lower chin and there is a small front speaker grill, with a front-facing camera next to it. Motorola’s standard setup of power/lock switch nestled above the volume rocker on the right side of the device is also present. We’re a little confused about the navigation button setup, though. The device almost appears to have hardware soft navigation keys, which most Motorola devices moved away from in the last year. The Back-Home-Multi-task buttons are below the display and embedded in the black bezel of the device’s front (at least in this render). That’s an odd move if that’s the case. The buttons are also not sporting the stock Android look, like we saw Motorola change to on the RAZR HD and RAZR M with Jelly Bean updates. So yeah, some interesting things going on there. We’re hoping it’s just the picture, and that Motorola hasn’t decided to go back to hardware buttons. Other than that, we’ve got no Motorola or Verizon branding, and the device really just looks like a mash-up of the RAZR M and RAZR HD from 2012. The design is not all that interesting or new. So we’re wondering now if the “DROID MAXX” is the DROID ULTRA MAXX that we were tipped to a week or so ago? Verizon is supposed to get three new DROID devices from Motorola this year – the ULTRA, ULTRA MAXX (or maybe just MAXX), and the ULTRA M (or Mini). This could very well be one of them. The model numbers for Verizon’s Moto lineup look like this: ULTRA (XT1080), MAXX (XT1080M), Mini (XT1030), and Moto X (XT1060). What do you guys think about the design? Motorola DROID ULTRA Makes First Appearance in White?